NOAA's GOES-13 satellite captured this visible image of the massive Hurricane Sandy on Oct. 28 at 1302 UTC (9:02 a.m. EDT). The line of clouds from the Gulf of Mexico north are associated with the cold front that Sandy is merging with. Sandy's western cloud edge is already over the Mid-Atlantic and northeastern U.S.
A series of satellite photos of Hurricane Sandy have captured eye-popping views of the frightening storm from space, showing the tempest in relation to the entire planet Earth, as well as its appearance at night. The new satellite views of Hurricane Sandy were snapped Sunday (Oct. 28) by the GOES-13 weather satellite and the powerful Suomi NPP Earth-watching satellite. Both satellites are used by NASA and the National Oceanic and Atmospheric Administration to monitor Earth's weather. 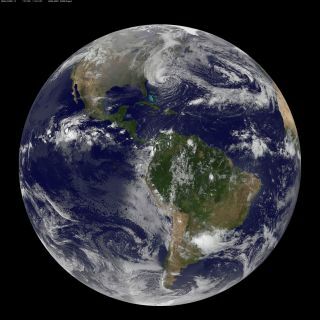 It was NOAA's GOES-13 satellite that captured the stunning view of Hurricane Sandy as it appeared on the entire disk of Earth. This night-view image of Hurricane Sandy was acquired by the Visible Infrared Imaging Radiometer Suite (VIIRS) on the Suomi NPP satellite around 2:42 a.m. Eastern Daylight Time (06:42 Universal Time) on October 28, 2012. In this case, the cloud tops were lit by the nearly full Moon (full occurs on October 29). Some city lights in Florida and Georgia are also visible amid the clouds. The nighttime view of Hurricane Sandy by Suomi NPP offers a more intimate view of the Category 1 hurricane. The image was taken at 2:42 a.m. EDT (0642 GMT) by a special "day-night band" instrument on Suomi NPP that can detect a wide range of light wavelengths, which allows the satellite to observe dim targets like auroras, city lights and reflected moonlight, explained Michael Carlowicz of NASA's Goddard Space Flight Center in Greenbelt, Md., in an image description. The night view of Hurricane Sandy shows the storm just east of Florida and Georgia, and bright city lights in both states can be seen in the image. The hurricane, itself, is revealed by moonlight reflecting off its cloud tops. The view was created by Jesse Allen and Robert Simmon at the NASA Earth Observatory, which regularly releases amazing views of Earth from satellites in orbit. The Suomi NPP (the name is short for Suomi National Polar-orbiting Partnership) is a joint project by NASA, NOAA and the U.S. Department of Defense. GOES-13 and Suomi NPP are just two of the many weather satellites currently tracking Hurricane Sandy. NOAA has also been using GOES-15, while NASA's Terra satellite and Tropical Rainfall Measuring Mission satellite have also been following the storm. As of early Monday (Oct. 29) Hurricane Sandy was a Category 1 storm with wind speeds of up to 85 mph (140 kph) as it approached the U.S. East Coast. The storm was expected to make landfall in Delaware and New Jersey on Monday night and cause substantial flooding and power outages, according to the National Hurricane Center.